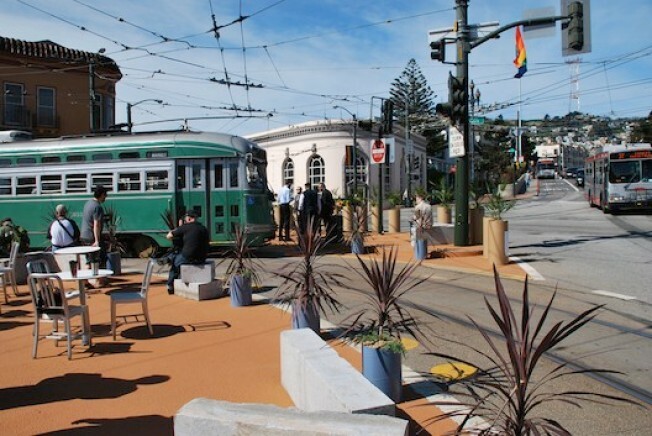 It was kind of expected that the "temporary" 17th Street Plaza in San Francisco's Castro district, the first of a number of Pavement to Parks projects, wasn't really temporary at all. Turns out the Board of Supervisors and the MTA may end up voting to keep it around permanently sometime in May or June. The installation, which was kind of scraped together using throwaway parts — some cardboard — hasn't been doing too hot with the bout of recent rains, and is due for longer-lasting replacements, such as concrete planters, and new tables and chairs. In the short-term, new pavement might help "distinguish the space from the street" at a cost of $40,000, while a $2 to $3 million project later down the line could raise the plaza to curb level.